“The week kicked off with 13 people plus babies/toddlers attending a fun babywearing cha cha class at the Dowse gallery, led by the lovely Hiria (who was ‘wearing’ her son in an SSC). The choreography was simple enough to pick up, and the gentle dance moves soothed some of the babies off to sleep. And dancing with a toddler strapped to your back is a pretty good workout! Later in the week, Hester helped a few people shop for material then use the material to make their own stretchy wraps. Thanks to our regular venue, the Southern Cross Garden Bar for the use of the Guest Room for the DIY session. Ending the week was our second ever sling walk. We decided to change the route this year to make it a bit easier to walk (ie flatter!) so registration was at Frank Kitts Park. Last year we had around 25 people attend so were expecting a similar number, maybe a bit more. So we were pleasantly surprised to see lots and lots of people with carriers turning up to register, so many in fact that we ran out of goodie bags. All up we had around 60 adults and around 40 children attend which was a fantastic turnout! 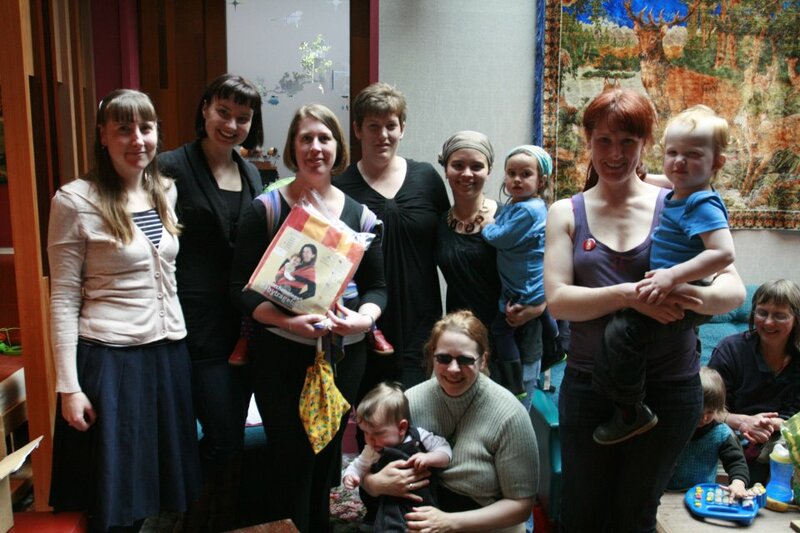 And an even bigger surprise was to discover that NZ Babywearing Week organiser Helen MacMillan and Slingbabies founder Jess Richards had flown down from Auckland for the day to attend. It was lovely to finally meet Helen and to see Jess again. 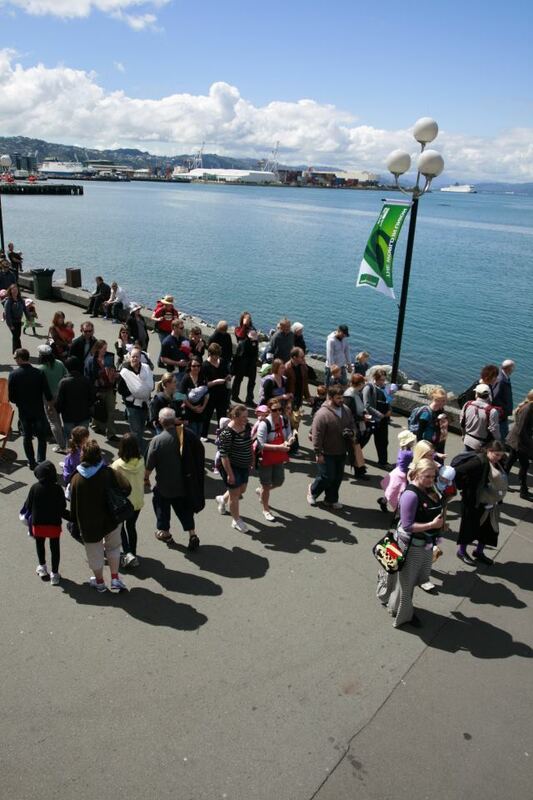 Wellington had put on a stunning afternoon for us, and we set off along the waterfront in the sunshine, attracting lots of looks from people wandering the other way. So much babywearing en masse was obviously quite a sight! 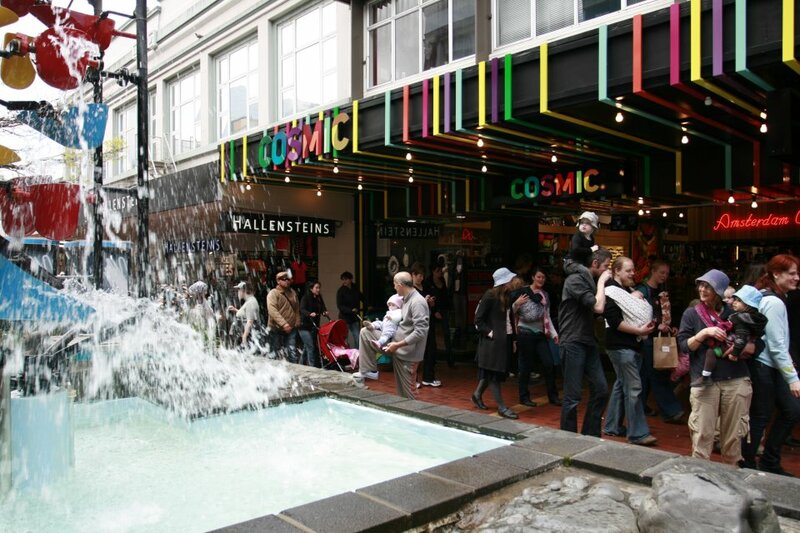 We walked around Te Papa and then along to Courtney Place, and up Dixon St. Then a lovely stroll taking in the sights and sounds of Cuba St before we arrived at the Southern Cross – the destination for afternoon tea and the prizegiving. Thanks again to the Southern Cross for hosting us and providing some yummy food platters. 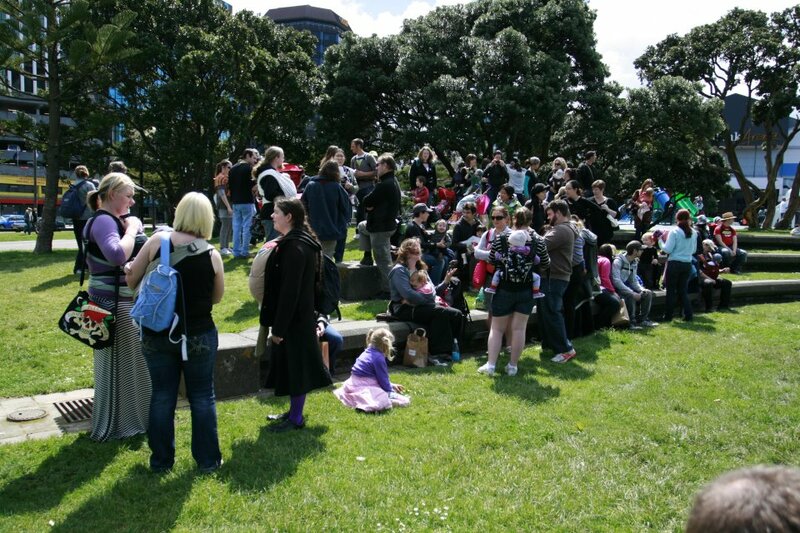 Thanks to the generosity of the NZ Babywearing Week sponsors and some local businesses, we had a great range of prizes to give away. We hope that all the winners enjoyed their prizes! At the end of the prizegiving, the committee got a prize of our own – a new Storchenwiege Albert woven wrap kindly donated from Helen (who also runs My Natural Baby). This brightly coloured wrap is a fantastic addition to our carrier library and is available to hire at our slingmeets. It was a lovely way to end a great afternoon. 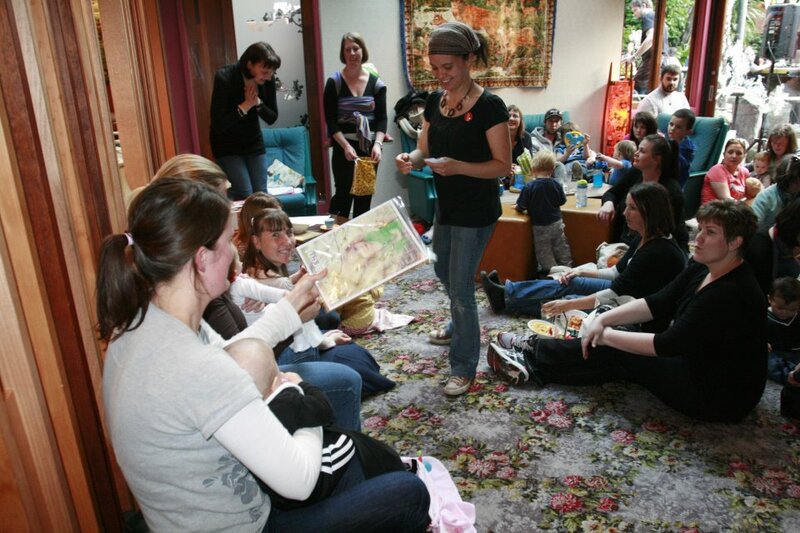 I’m looking forward to seeing what the Babywearing Wellington Committe will be organising for the 2012 New Zealand Babywearing Week Celebrations! 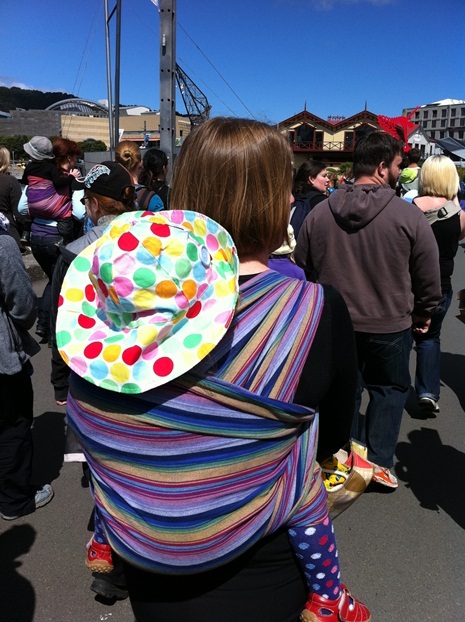 This entry was posted in New Zealand Babywearing Week and tagged baby carrier, baby sling, babywearing walk, Babywearing Wellington, New Zealand Babywearing Week, Storchenwiege woven wrap. Bookmark the permalink.